GenreOnline.net: Kathryn Bigelow Joins Sundance Award-Winner CARTEL LAND As Executive Producer; First Poster Unveiled! 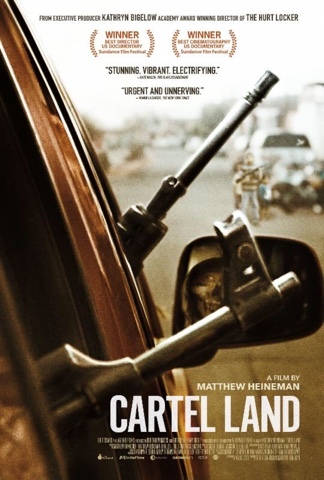 Kathryn Bigelow Joins Sundance Award-Winner CARTEL LAND As Executive Producer; First Poster Unveiled! Oscar-winning director Kathryn Bigelow (THE HURT LOCKER, ZERO DARK THIRTY) has joined Matthew Heineman's documentary CARTEL LAND as Executive Producer. The film was produced by Tom Yellin and Heineman, and Molly Thompson of A&E IndieFilms (JESUS CAMP, THE IMPOSTER, THE SEPTEMBER ISSUE) is also an Executive Producer. The Orchard acquired the film out of Sundance and is releasing it theatrically on July 3in New York and July 10 in Los Angeles. The film will then expand into select cities nationwide. Today, The Orchard has also unveiled the first poster for the film, which can be downloaded here. VICE Media, the world's leading youth media company and digital content studio, has also come on board to partner with The Orchard in the promotion of CARTEL LAND. In the Mexican state of Michoacán, Dr. Jose Mireles, a small-town physician known as "El Doctor," leads the Autodefensas, a citizen uprising against the violent Knights Templar drug cartel that has wreaked havoc on the region for years. Meanwhile, in Arizona's Altar Valley - a narrow, 52-mile-long desert corridor known as Cocaine Alley - Tim "Nailer" Foley, an American veteran, heads a small paramilitary group called Arizona Border Recon, whose goal is to stop Mexico's drug wars from seeping across our border. Filmmaker Matthew Heineman embeds himself in the heart of darkness as Nailer, El Doctor, and the cartel each vie to bring their own brand of justice to a society where institutions have failed. CARTEL LAND is a chilling, visceral meditation on the breakdown of order and the blurry line between good and evil. At the 2015 Sundance Film Festival, Heineman received both the Directing Award and Special Jury Award for Cinematography in the U.S. Documentary competition.